In a market enjoying a sustained period of solid growth, Darwin based general hire company Go Hire is riding the wave of success. With 45 years of hire industry experience amongst senior management, Go Hire has put their faith behind Genie for their AWP fleet. Although Go Hire was established by Chris Wilson in January 2011, Chris started in the industry under his father, Larry Wilson, who is considered something of an industry figure in the Darwin market. When Larry Wilson sold Wilson Hire, Chris saw that a new opportunity presented itself in the market. “Dad had built the general hire business on customer service and high quality product,” said Chris Wilson. With two years of operation now behind Chris, the re-entry to the business has definitely paid dividends. The Top End is supporting Go Hire as “the locals” and this extends across all market segments from local tradies to the bigger projects in mining and construction. A significant reason behind the success of Go Hire in the AWP area is their Genie fleet. Every unit in the fleet is Genie, but one. The Genie models in the Go Hire fleet cover booms to Key players at Go Hire include (L to R) Anthony Schuppan, Robert Lavender and Chris Wilson 45ft, RT scissors, electric scissors, single man lifts, a telehandler and a 6 m scissor which is available on a tandem trailer. With so many big projects under way in the Top End, the Darwin market has become very competitive, although Chris Wilson prefers the term ‘cut throat’ as a more accurate description. “Genie is vitally important to our success in the access market,” said Chris Wilson. A booming market in Darwin has seen an increase of Genie® access equipment being used in this region. 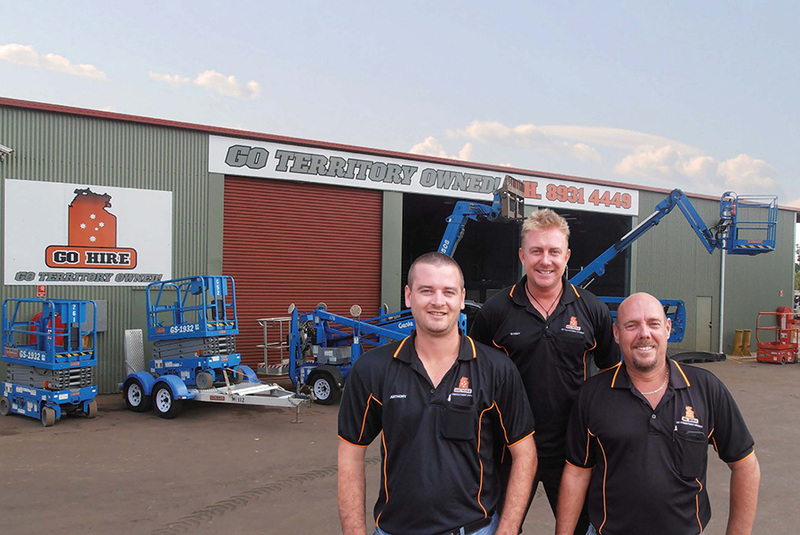 To support customers in Darwin, Genie MAINTAINS a solid supply of parts in Darwin. With dedicated service via Joab Coyne at Darwin Access Services, there is now easy access to Genie parts on a 24/7 basis. Instead of having to bring in parts from a Genie store in Brisbane, typically a two day turnaround, a big inventory of fast moving parts for Genie models is on hand in Darwin. A review of Genie equipment operating in the Top End, together with an evaluation of the parts history in the region, determined the specific range of parts held in stock. Having been operational already for a few months, the system is working well.